A slightly fuller and larger format version of this page is available on Cabbala.html. Cabbala, Yeats's normal spelling, is also spelt Cabala, Kabbalah, or Qabalah, along with other variant transliterations of the Hebrew (American Heritage cites more than two dozen). It means 'tradition', 'received doctrine', 'received teaching', or 'received wisdom' (qabalah comes from the same triliteral root, QBL (qoph, beth, lamed), as qibel, to receive). There has been a tendency to use the spelling with ‘C’ for the Christian Cabbala, that with ‘K’ for the Hebrew, and that with ‘Q’ for esoteric or magical interpretations, but this is by no means uniform. The older is the brief Sepher Yetzirah, the Book of Formation, which probably dates from a time between the 2nd and the 6th centuries CE, and of which there are several versions of varying authority. The emphasis in this short treatise is the Hebrew alphabet and its mystical dimensions. Don Karr provides a thorough survey of versions and translations into English, along with links to online versions here (PDF); visit other web-sites for an online text of William Wynn Westcott’s translation, either here or here (the bibliographic reference for Westcott's translation in this site’s bibliography); a fuller list of online versions and commentaries for those who want more, at Psyche.com. Far longer is the Zohar or Book of Splendour, which is in fact a series of books and dialogues of some complexity. The core texts are Sifra Detzniyutha (the Book of Concealed Mystery), Idra Rabba Qadusha (the Greater Holy Assembly), and Idra Zuta Qadusha (the Lesser Holy Assembly), available in translation at the Work of the Chariot web-site; visit another web-site for further comment. S. L. MacGregor Mathers published an English translation of these three books of the Zohar, as The Kabbalah Unveiled, though this was rather a translation of Knorr von Rosenroth's seventeenth-century Latin translation. Mathers' Introduction gives an exposition of his approach to the Cabbala (visit another web-site for an online text). The Cabbala which Yeats knew was that filtered through the earliest Golden Dawn, primarily by Mathers and Westcott, and much subsequent scholarship on more authentic Kabbalah is not necessarily relevant in this particular area (though see below). The Golden Dawn’s teachings themselves changed and developed, so that later versions, such as that given by Israel Regardie in The Golden Dawn are not necessarily accurate reflections of what Yeats was studying. One of the best guides is the collection of ‘Flying Rolls’ edited by Francis King in Ritual Magic of the Golden Dawn. Westcott gave two lectures to the Theosophical Society in 1891 and 1893, collected in a pamphlet 'The Kabbalah of the Golden Dawn', and A. E. Waite, another member of the Order, published The Doctrine and Literature of the Kabalah (1902), The Secret Doctrine in Israel. 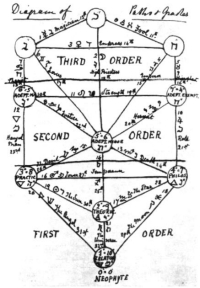 A study of the Zohar and its connections (1913), combined and revised as The Holy Kabbalah. A study of the secret tradition in Israel (1929). Israel Regardie, a later member of the Order, published one of the more succinct introductions to the Golden Dawn's approach in A Garden of Pomegranates (an allusion to a work by the sixteenth-century rabbi Moses or Moshe Cordovero, Pardes Rimonim). Originally deriving from the Torah (especially Genesis) and the Vision of Ezekiel (the Chariot of God), a large body of thought is arranged through a schema based on the names of God, the Hebrew alphabet and the digits, and these themselves can be organised into a diagram called "The Tree of Life". The ten digits form the centres of Divine Manifestation, called "Sephiroth" (singular: "Sephirah"), which are connected by twenty-two paths corresponding to the letters of the Hebrew alphabet. The layout of the paths, and the attribution of the letters to the paths, varies in different versions, but the Golden Dawn adopted that given by Athanasius Kircher in Oedipus Aegyptiacus (1652-54) and, with minor adjustments, this has the widest currency now. One major difference from Kircher’s version of the diagram, however, is the attribution of the planets to the Sephiroth. Kircher attributes the lowest Sephirah, Malkuth, to the Moon, Yesod to Mercury, Hod to Venus, Netzach to Mars, Tiphareth to the Sun, Geburah to Saturn and Chesed to Jupiter, so that the planets are not connected with the three highest Sephiroth. This scheme entails reversing the normal order of Jupiter and Saturn, placing Saturn between Jupiter and Mars, against tradition and actual orbit, and the Sun is placed between Saturn and Mars, which goes against tradition. The Golden Dawn attributions are almost entirely different: Malkuth is associated with Earth and Yesod with the Moon, Mercury with Hod and Venus with Netzach; Tiphareth is still attributed to the Sun, but Mars to Geburah, Chesed is still attributed to Jupiter, but Saturn to Binah. The Golden Dawn rearrangement means that the planets follow the ‘Babylonian order’ (Moon, Mercury, Venus, Sun, Mars, Jupiter, Saturn) exactly, but that one of the highest three Sephiroth is now given a planetary attribution. The Tree of Life from Athanasius Kircher’s Oedipus Ægyptiacus. Click the image for a larger (600 KB) image in a new window. Various versions of the Tree, including an English translation of the version given here, are available here. There are also four worlds or levels of Manifestation, corresponding to the letters of the ineffable name of God, YHVH (Yod, Heh, Vau, Heh). The Jewish Cabbala was adopted by Christian thinkers during the Renaissance, most notably Giovanni Pico della Mirandola, Johannes Reuchlin and Guillaume Postel, and became intertwined with the Rosicrucian tradition, which arose in the early seventeenth century with a spate of anonymous manifestos. During the seventeenth century writers such as Robert Fludd, Jacques Gaffarel and Henry More all used the Cabbala in their investigations, but relied on the writings and the theological insights more than any single symbol. In contrast, for nineteenth-century occultists the system's attractiveness lay largely in the flexibility and universality of the symbol of the Tree of Life, an approach already partially seen in H. C. Agrippa's Occult Philosophy in the sixteenth century (see especially the chapters on number and divine names, available from Esoteric Archives' website). 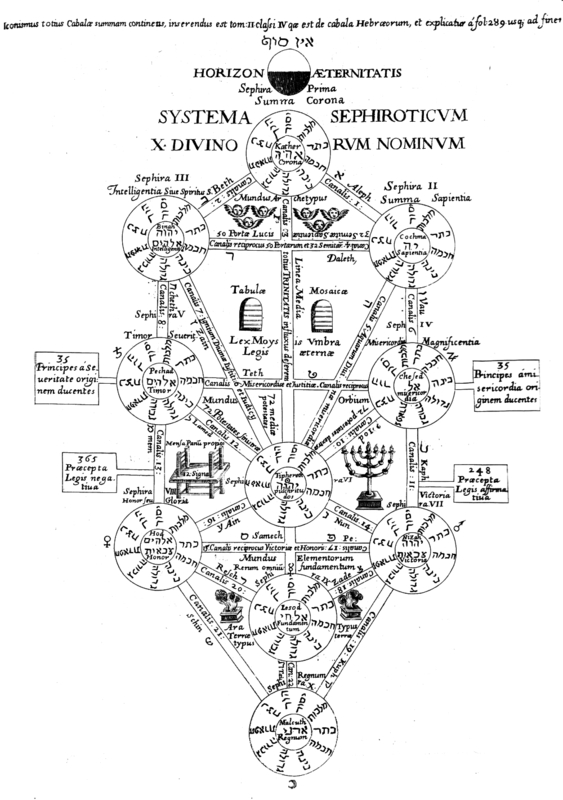 Athanasius Kircher gave an exposition of the Cabbala, along with much more, in Oedipus Ægyptiacus including a particular layout of the Tree of Life that was adopted almost universally by European occultists (see above). Though more traditional versions had distinguished between horizontal paths, vertical paths and diagonal paths, assigning the Hebrew letters according to the distinctions given in the Sepher Yetzirah, in Kircher’s version the paths between the ten sephiroth are numbered sequentially, those from the highest sephirah, Kether, being the first three letters of the Hebrew alphabet and so on. The importance of the Tree of Life in whichever form, however, is that it provides a framework for the syncretist correspondences which are central to ‘magic’: the Sephiroth and paths subsume astrology, along with its traditional attributions of most the phenomenal world to one or other of the planets or signs of the Zodiac, as well as the pagan Pantheons, geomancy and the Tarot. 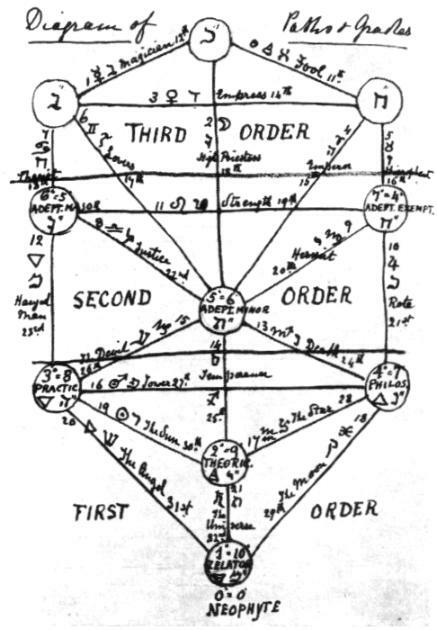 Diagram of the Grades of the Hermetic Order of the Golden Dawn upon the Tree of Life. Click the image for a larger image in a new window. 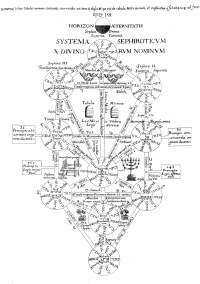 The whole of the Golden Dawn's structure as an Order, as well as most of its teaching, was structured around the Tree of Life. In the diagram on the left, MacGregor Mathers sketched the various grades of the Order at each of the Sephiroth, indicated by the initial letter of the name. Each Grade is given a double number, the first corresponding to the level of attainment from 0 to 7, properly written in a circle, and the second corresponding to the associated Sephirah, properly written in a square. In order of progression of initiation, the lowest is the unassigned Neophyte (0=0), Zelator (1=10) at Malkuth, Theoricus (2=9) at Yesod, Practicus (3=8) at Hod, and Philosophus (4=7) at Netzach, comprising the Outer or First Order. The Inner or Second Order comprised Adeptus Minor (5=6) at Tiphareth, Adeptus Major (6=5) at Geburah, and Adeptus Exemptus (7=4) at Chesed, which was originally the highest Grade attainable, since the highest three Grades (the Third Order) were regarded as beyond normal human attainment. Each Path is numbered and labelled with the corresponding Hebrew letter, following Kircher. It is also given its attributed Tarot card, the card's traditional number, and the astrological association, following a scheme of the Golden Dawn's own, drawn from the Order's founding Cipher Manuscript (probably written by Kenneth Mackenzie, but claimed to be of more mysterious and ancient provenance). 1°= 10° was the first ceremony, associated with the tenth Sephirah, Malkuth (The Kingdom), and the element Earth. No paths lead to Malkuth; the Grade conferred in the ceremony was Zelator, and the mystic title ‘Periclinus de Faustis’. 2°= 9° was the second ceremony, associated with the ninth Sephirah, Yesod (The Foundation), the Moon, and the element Air. Path 32, the letter Tau, leads from Malkuth to Yesod and is associated, ‘The Universe’ and Saturn. The Grade conferred in the ceremony was Theoricus, and the mystic title ‘Poraios de Rejectis’ (Brought From Among the Rejected). 3°= 8° was the third ceremony associated with the eighth Sephirah, Hod (Splendour), the planet Mercury, and the element Water. Path 31, the letter Shin, leads from Malkuth to Hod and is associated with ‘Judgement’ and Fire. Path 30, the letter Resh, leads from Yesod to Hod and is associated with ‘The Sun’ and the Sun. The Grade conferred in the ceremony was Practicus and the mystic title ‘Monocris De Astris’ (The Unicorn from the Stars). 4°= 7° was the fourth ceremony associated with the seventh Sephirah, Netzach (Victory), the planet Venus and the element Fire. Path 29, the letter Qoph, leads from Malkuth to Netzach, and is associated with ‘The Moon’ and Pisces. Path 28, the letter Tzaddi, leads from Yesod to Netzach and is associated with ‘The Star’ and Aquarius. Path 27, the letter Peh, leads from Hod to Netzach and is associated with ‘The Tower’ and Mars. The Grade conferred in the ceremony was Philosophus and the mystic title ‘Pharos Illuminans’ (The Illuminating Tower of Light). The Portal Ritual was not assigned to a Sephirah, but to the Paroketh or the Veil separating the lower part of the Tree from Tiphareth, the sixth Sephirah. It was associated with Spirit, the top-most point of the Pentagram, which was the fundamental magical symbol used in the Order (especially in the Banishing and Summoning Rituals of the Pentagram). The association of the Tarot with the Hebrew alphabet and the Tree of Life is in some ways the strangest Cabbalistic development, starting from an idea of Antoine Court de Gébelin at the end of the eighteenth century, whereby the gypsy tarot became the Tarot of the Egyptians, or the 'Book of Thoth'. This view was adopted by Etteilla and then Eliphas Levi, who brought in the identification with the Cabbalistic Tree of Life and the twenty-two trumps with the twenty-two letters of the alphabet (see Westcott's translation of Levi's The Magical Ritual of the Sanctum Regnum Interpreted by the Tarot Trumps, which also includes the seven ancient planets to give the 29 days of the Moon). The association was consolidated triumphantly by the Golden Dawn, but changed radically by shifting most of the cards’ positions by one letter. Since the twenty-two letters of the alphabet represent the paths of the Tree of Life, the Tarot cards became the Golden Dawn's main tool for navigating between the energies represented by the Sephiroth, in turn incorporating the symbolism of the Zodiac and the other attributions which the Golden Dawn brought to the Tree. (See Kathleen Raine's essay, Yeats, the Tarot and the Golden Dawn in Yeats the Initiate.) The Egyptian associations were not accepted by all in the Golden Dawn, but the Egyptophiles saw the 'atouts', French for trumps, as the "Atus of Thoth", the Egyptian god of writing, and derived 'Atu' from the Egyptian word 'Aat' meaning mansion, so that Mathers declares that the twenty-two trump cards correspond to the twenty-two letters of the Hebrew alphabet and "the twenty and two letters are the twenty and two Atus or Mansions of Thoth". A. E. Waite rejected most Egyptian claims for the Tarot, but has had huge influence through the Tarot deck which he directed Pamela Colman Smith to design for the publishers Rider and Co. (she had been involved in Yeats’s early experiments with theatre); see his Key to the Tarot (on-line text). After the Tarot de Marseille, the ‘Waite-Smith-Rider’ Tarot (unfairly known better as the ‘Waite-Rider’ or simply ‘Rider’ Tarot) is still probably one of the best known packs and carries many of the Golden Dawn’s ideas and Cabbalistic associations (viz Decker and Dummett, A History of the Occult Tarot 1870-1970). Much modern scholarship understandably views the Golden Dawn’s use of the Cabbala as a tendentious and partial: Mathers and Westcott were selective and sometimes Procrustean in their approach, fitting everything to their magical ends, and this included dissimulation over the origins of the Cipher Manuscript which gave the Order its origin and Hermetic imprimatur. A. E. Waite’s scholarship, while full of detail and insight, can also be strangely dismissive and distant. The Golden Dawn’s version of Cabbala has, however, had huge influence in the twentieth century and it is certainly the form that Yeats knew. Even those who reject the Golden Dawn’s version of Cabbala entirely, usually have to deal with it and can find it difficult to escape entirely from their influence. An interesting example is the Revived Qabala, based on the work of Carlo Suarès, which dismisses the Golden Dawn as a group of Victorian English ‘gentlemen’ (Mathers would have hated to be seen as English rather than Scottish), who had no respect for Judaic heritage, and sees their Tarot attributions as doing violence to the Sepher Yetzirah; yet the scheme adopted by Revived Qabala attributes the same astrological elements to the same Tarot cards (and uses the designs of Waite and Colman Smith), and it agrees with the letter correspondences except for the seven ancient planets, where the letter attributions of the older versions of Sepher Yetzirah are used to reorder the Tarot sequence. (So, for example, the card of the The Wheel is kept with Jupiter, but while the Golden Dawn attributed this card to the letter Kaph, the eleventh Hebrew letter, Revived Qabala takes the older association of Jupiter with the letter Gimel, the third letter, so that The Wheel moves to become the third card in the sequence of the Tarot.) It would seem to be fairer to regard the Golden Dawn’s contribution as a pioneering and vivifying initiative, even if incomplete and partial in its application, particularly with respect to Cabbala. It is almost impossible, however, to point to any one strand of modern Cabbalism/Kabbalism/Qabbalism that is unassailably more authoritative than another, though some make the claim, since there are many approaches to the core material. The work of Gershom Scholem (1897-1982) has been fundamental in establishing a scholarly study of Kabbalah and Jewish mysticism, even if particular points are disputed (see a succinct appreciation by Sharon Naveh). There are now many resources offered on the Web, with varying emphases and varying degrees of traditionalism or syncretism; it is just worth rememembering, if you are new to this area, that it is probably wise not to take the first version found as necessarily the only or the best one.